Items marked * are kayak-only access; ** denotes a YouTube video is available. *1. Upper Magothy above bridge: headwater marsh, SAV, wildlife. **2. Beachwood Park and Launch: 150 yard carry for paddlers; nature trail. 3. Totem pole at Camp Whippoorwill (GSA) at mouth of Cockey Creek. 4. Cockey Creek: kayak access only to headwater marsh. 6. North Ferry Pt: divers have found remnants of old ferry dock. 8. Eagle Hill: Highest point in the watershed, overlooks Broad Creek and Blackhole Creek. Named for the numerous eagles seen here. *10. Park Creek and Park Lake: 1 foot depth at entrance; scenic. **11. Dobbins Island: popular anchorage on the Sillery Bay side. Passengers were carried in a horse-drawn carriage across the sandbar that still exists between Dobbins Island and the mainland. **12. Grays Creeks: protected anchorages; northern branch paddle only. Fuel dock at southern branch at Atlantic Marina. **13. Cornfield Creek: protected anchorage; extensive natural shoreline. **14. Red House Cove, Eagle Cove and Gibson Island Inner Harbor: protected anchorages; extensive natural shorelines. 16. 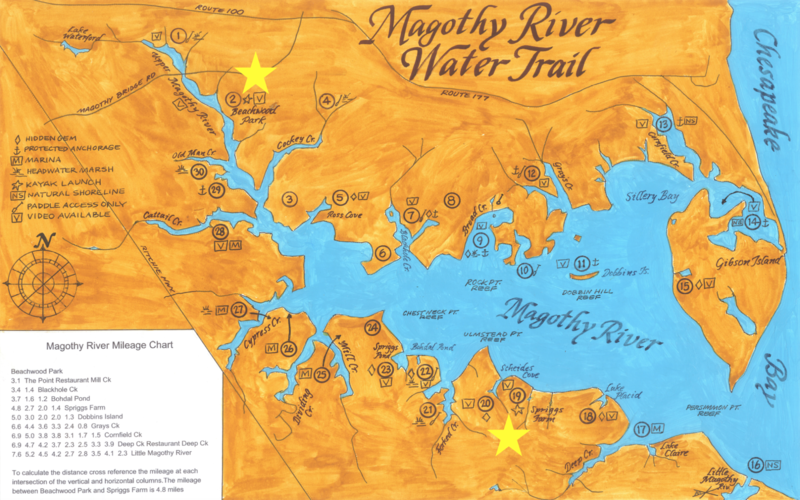 Little Magothy River: narrow, shallow entrance. Natural shoreline at headwater marsh. 17. Deep Creek: scenic; natural shoreline at headwaters; home of boater-friendly Deep Creek Restaurant. Fairwinds Marina at confluence with mainstem. **19. Spriggs Farm Park: Paddling launch, 130 yard carry with steep slope before launch. To obtain combination to gate, go to www.aacounty.org/RecParks/parks/community/spriggs.cfm. 21. Forked Creek: scenic views; kayak only to headwater marshes. Home of Belvedere Yacht Club. 24. South Ferry Point is the historic site of the Mago Vista Beach Club, complete with a dance hall, high diving board and an alligator pond. Now home to The Moorings condominiums. 25. Mill Creek: scenic; Ferry Point Marina and boat-friendly The Point Crab House and Grill at entrance. 26. Dividing Creek: scenic; Magothy Marina with gas dock at entrance. 27.Cypress Creek: Home of Cypress Marine; scenic marshes at headwaters. 28. Hamilton Harbour Marina just north of Cattail Creek entrance. 29. Tar Hill Cove: cove marsh at headwater. 30. Old Man Creek: scenic; headwater marsh.